Newport Caravan Park may be found just a few miles from Great Yarmouth, in the popular holiday village of Hemsby, where the pace of life is decidedly slower, an added quality to the tranquility of your holiday. However, whilst you're at Newport Caravan Park you're never far from the attractions, including our own facilities and entertainments right here on the site. There's something for everyone, whether you are a toddler who enjoys paddling and building sand castles on the beach, a teenager who enjoys disco, live music and dancing, for parents who would like to have a drink with live entertainment and keep an eye on their youngsters in the Newport Club, or if you're of mature years and would just like to relax in the quiet atmosphere of Norfolk, stroll along the beach or take a trip on a day boat at Potter Heigham or Wroxham and enjoy a game of cash Bingo after tea, our site is ideal. Newport Caravan Park also offers a tent/motorcaravan and touring caravan site, which during the high season of July and August it is advisable to pre-book. If you are coming to holiday here, there are a few details for you to view on our booking page. Double bedroom, Twin bedroom with child's bunk above, removable cotside available. Double bedroom, Twin bedroom and Twin bedroom with removable cotside available. Double bedroom/Twin or occasional Double bedroom Fridge/Freezer & Microwave. Luggage may be sent in advance at owners risk. All mail should be addressed c/o Newport Caravan Park (Norfolk) Ltd, Hemsby, Great Yarmouth, NR29 4NW. with the recipients name clearly written and must be collected from the office. Public telephones and post box on site. Buses terminate at park entrance for Great Yarmouth route and run during main season. Caravanners are asked in their own interests to arrive no later than 7pm on the Saturday. They will require to check in at the office to obtain their keys. The office will be open from 8.00am to 6pm and until 10.00pm on Saturdays, visitors arriving after that time must make their own arrangements until the morning. Caravans are not available for incoming tenants before 3.00pm on day of arrival and must be vacated by 10.00am on day of departure, left clean and ready for incoming tenants. Browser Versions NS4/IE4 & above. 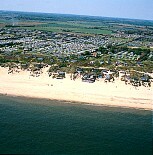 © Copyright 2000 Newport Caravan Park (Norfolk) ltd.. All rights reserved.